HomeProductGroceryCoffeeCoffee Mate Creamer 6 oz. Coffee Mate Creamer 6 oz. The original rich and deliciously creamy non-dairy creamer. Perfect anytime you want to enjoy a velvety-smooth cup of coffee. Coffee Mate Creamer 11 oz. Folgers Classic FAC 11.3 oz. Folgers Decaf Classic FAC 11.3 oz. Folgers Instant Coffee 3 oz. Folgers Instant Decaf Coffee 3 oz. Maxwell House Coffee Original 11.5 oz. Maxwell House Colombian 10.5 oz. Maxwell House Instant 2 oz. Maxwell House Master Blend FACM 11.5 oz. Carnation Evaporated Milk 12 oz. Carnation Sweetened Condensed Milk 14 oz. Not a significant source of dietary fiber, sugar, vitamin A, vitamin C, calcium, and iron. CORN SYRUP SOLIDS, HYDROGENATED VEGETABLE OIL (COCONUT AND/OR PALM KERNEL AND/OR SOYBEAN), SODIUM CASEINATE (A MILK DERIVATIVE)**, LESS THAN 2% OF DIPOTASSIUM PHOSPHATE, MONO- AND DIGLYCERIDES, SODIUM ALUMINOSILICATE, ARTIFICIAL FLAVOR, ANNATTO COLOR. CONTAINS: A MILK DERIVATIVE. COFFEE-MATE is America's #1 coffee creamer, backed by the power of millions of devoted fans. With America's favorite brand of creamer in the home and office, everyone can enjoy coffeehouse indulgence without ever leaving the building. 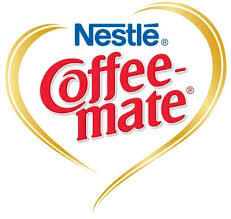 Businesses realize COFFEE-MATE is a powerful business builder, as studies show customers will visit a location more often if COFFEE-MATE is offered. COFFEE-MATE is Preferred by Taste. Preferred by Name. Item Description: Coffee Mate Creamer 6 oz.